The transition to ICD-10-CM has been postponed to 2015, but we can take advantage of this additional time to fully prepare. To start, we can identify policies using ICD-9-CM codes and determine how the transition to ICD-10-CM will impact those policies. The Local Coverage Determinations (LCDs), published by regional Medicare Administrative Contractors (MACs), outline coverage and documentation requirements for specific CPT codes. In the following FAQs, we will discuss some of the most common questions regarding the ICD-10-CM LCDs. Q: What exactly are these future LCDs? A: The proposed future LCDs have been updated to reflect current clinical practice and to capitalize on the expanded data collection opportunities with the new ICD-10-CM code set. Not all existing LCDs will be converted to the new code set; CMS recognizes that some were outdated, and these LCDs will reflect the coverage guidelines. Q: If the ICD-10-CM code is listed on the LCD, does that mean the claim will be paid? "Documentation supporting the medical necessity of these services, such as ICD-10-CM diagnosis codes, must be submitted on each claim. Failure to do so may result in rejection or denial of the claim(s). It is not enough to link the procedure code to a correct, payable ICD-10-CM diagnosis code. The diagnosis must be reasonable and medically appropriate for the clinical situation. Documentation within the beneficiary's medical record must support the medical necessity for the services." 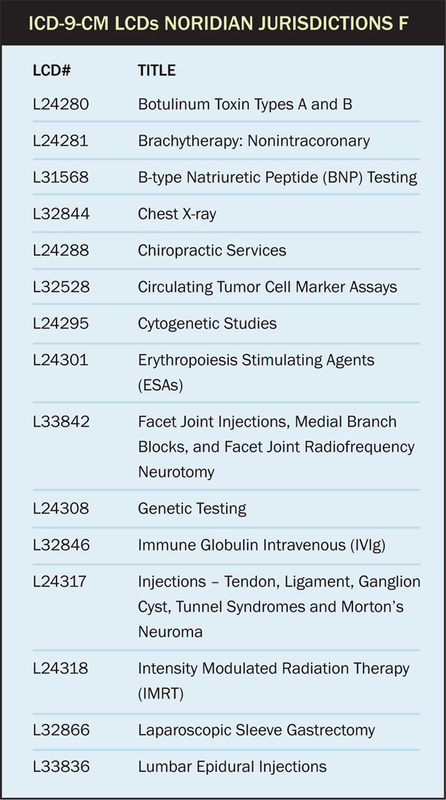 Q: The LCDs are most often used to determine the allowed diagnosis codes. Is there any additional information in the LCDs that should be reviewed? For nonhospital-based outpatient services, it is expected that the ordering/referring physician/nonphysician practitioner generate a written order/referral indicating the medical necessity for the additional 3-D imaging. For nonhospital-based outpatient services, the medical record documentation maintained by the ordering/referring physician/nonphysician practitioner must clearly indicate the medical necessity of the 3-D imaging and includes, but is not limited to, relevant medical history, physical examination, and results of pertinent diagnostic tests or procedures. The documentation should state the need for this separate service and should be included in the interpretation. The documentation should be legible, must be maintained in the patient's medical record, and must be made available upon request. When 3-D interpretation is deemed urgently needed by the interpreting physician, the documentation must include the time of the study, the specific medical need for the study, and a summary of the findings that were urgently needed and transmitted to the ordering/referring physician /nonphysician practitioner whose name is on the order/referral for the study. This documentation should be legible, must be maintained by the interpreting physician, and must be made available upon request. This information is valuable to both the ordering provider and the interpreting radiologist. The guidelines may be more stringent than those recommended by the American College of Radiology (ACR) but when available, the guidelines for a specific payor must be followed. The second section of the LCD worth reading is at the very bottom of each document, under the section "Sources of Information and Basis for Decision." Here, a provider can evaluate the timeliness of the standards of practice used to determine the guidelines. For example, for the 3-D postprocessing LCD, the sources used are limited to a coding Q&A by the ACR and LCDs by three other contractors. If a provider were to strongly disagree with this LCD, they could look at the sources used to see if it needs to be revised. If additional clinical information can be provided to demonstrate why other conditions should be covered, there may be room for a revision. Q: How can a provider give feedback on these LCDs? A. The MLN Matters article number MM8348 states, "The policies will not be considered new policies. CMS considers this type of update to be a coding revision that does not change the intent of coverage/noncoverage within an LCD. Therefore, if a MAC only translates ICD-9-CM codes to the appropriate ICD-10-CM code, the policy does not need to be vetted through their Carrier Advisory Committee or be sent through the public comment and notice process. However, if a MAC decides to revise more than just the ICD-10-CM codes, they will follow the normal LCD development process outlined in the Medicare Program Integrity Manual." All new LCDs are first published in draft form, with a timeframe for public comments. The best way to find out about new draft LCDs is to register with your regional MAC's website for notifications related to LCDs – the sooner you are able to review the draft, the more time you will have to submit your comments. Q: When will these LCDs be finalized? A: CMS requires all contractors to follow a specific process for finalizing new and revised LCDs. Contractors must allow for 45 days for public comment and post a summary of the comments received, as well as the responses to those comments. LCDs that are not required to follow this process will be finalized at a date yet to be determined by the individual MACs. Q: When will these LCDs become effective? A: The implementation of ICD-10-CM will not happen before October 1, 2015. Each of the proposed or future LCDs has listed "N/A" as the revised effective date. It will be interesting to monitor the local contractors and see which new clinical practice guidelines are implemented in the current claims processing system, with the ICD-9-CM code set. Q: Will the ICD-10-CM LCDs be the same for all regions? A: Unfortunately, no. Although the disparity between states and MACs coverage under the LCDs has been noticed by the Office of Inspector General, and there is an ongoing review to determine how these differences impact physician reimbursement, there will most likely continue to be differences in coverage from state to state. 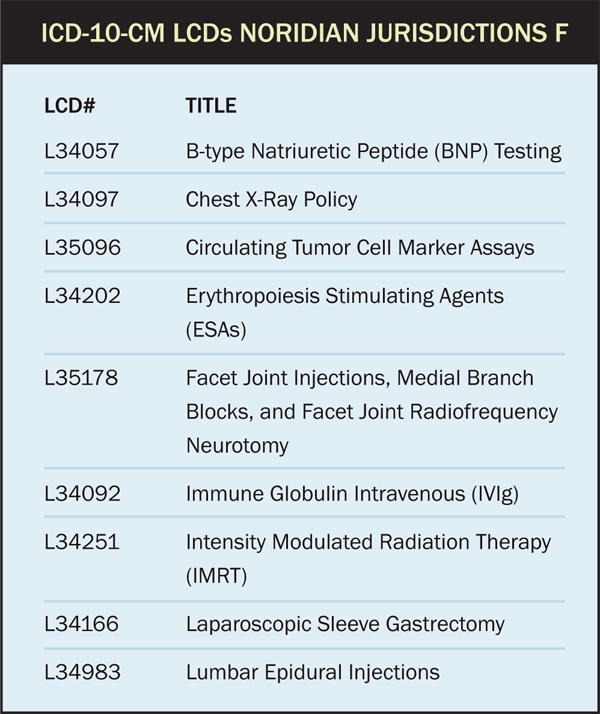 In the boxes are examples of some of the ICD-10-CM LCDs (available June 18, 2014) for two different regions. Q: Will the list of topics covered by the LCDs remain the same? A: No. In some cases the LCD will be retired, but there will also be cases where new topics are added to the LCDs for ICD-10-CM. It is also important to remember that the list currently available is not final – as we get closer to the implementation date, more LCDs are likely to be published. It will be important to check the LCDs for each MAC/region you have clients in. 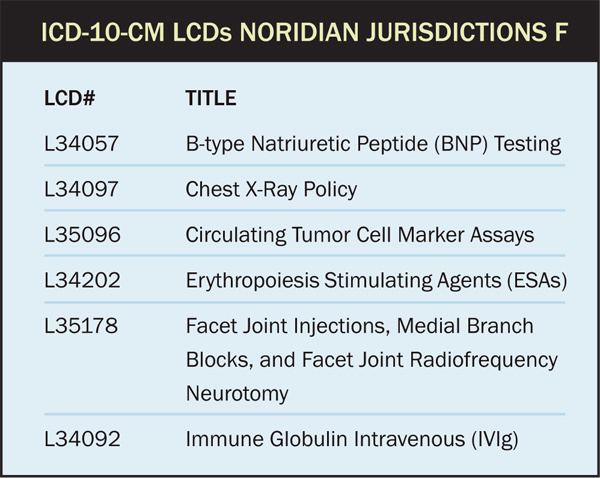 As an example, see the boxes for lists (available June 18, 2014) of some of the current and future LCDs for Noridian, which handles jurisdiction F.
The implementation of ICD-10-CM will require many changes – the LCD revisions are key among them. Regardless of the implementation date, it is important to regularly check the list of LCDs. The review and revision of the current ICD-9-CM LCDs is an ongoing process, and we can expect more LCDs to be added to the "future" list as they are revised.